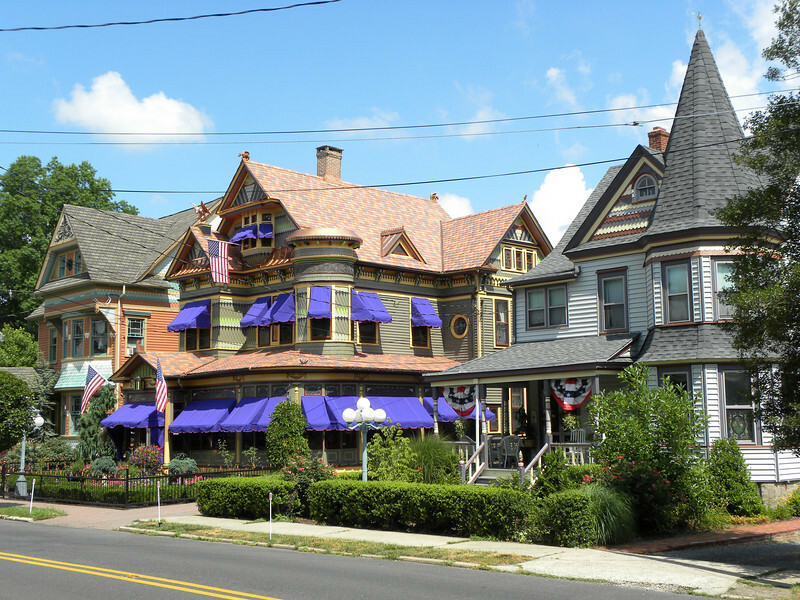 Three painted ladies convey the artful essence of Hightstown’s historic district, reflecting the ornament of eclectic Victorian architecture. The Queen Anne residence in the center, was built by the town’s undertaker, Elmer Rogers, and given to his bride as a wedding present in 1892. Though it underwent many transitions over the past 120 years, including subdivision into apartments, the grand home has been extensively restored over the last decade, and remains now a single-family home as a key contributing resource in the Historic District. The interior boasts original geometric patterned oak floors, chestnut pocket doors and moldings gracing Victorian furnished parlors and a formal music room with grand player piano adjacent to the chestnut paneled dual landing staircase. Silk portieres, domed ceilings, and original stained glass designed to complement the Rogers family crest adorning the main fireplace surround are just a few of the details that convey the original owners enjoyment of Victorian expression in architecture. The Stockton Street Historic District Streetscape project is the result of a community-driven and historically-focused economic stimulus plan. Even before the recession, Hightstown Borough struggled to keep its local economy afloat. Suburban development patterns made it difficult for locally-owned businesses downtown to survive. Its industry had shut its doors, and the housing crisis only added to the number of abandoned properties scarring the borough. With traditional mechanisms of economic stimulus limited, Hightstown developed a master plan that focused on re-establishing the borough as a destination town for visitors, similar to when it was a thriving railroad hub. Restoring the town’s historic culture and marketing its small town pride is a central theme of the plan. The Stockton Street Historic District Streetscape project is a direct implementation strategy of this plan. The Stockton Street Historic District is located in the Borough of Hightstown (pop. 5,216) in Mercer County, New Jersey. Seventy-six historic resources, predominantly single family dwellings, a stone church, and a historic monument contribute to this 14.35-acre district. These buildings are historically significant with varying architectural styles including early Federal, high-style Victorian, and turn-of-the-century eclectic. The project, which is scheduled to begin construction in August 2010, seeks to restore the district's sidewalks to an eclectic mix of brick and slate. In addition, a granite curb will be constructed throughout the district to help define its boundaries by creating a consistent and distinctive look. Construction will be sensitive to unearthing carriage steps and resetting them in place along the street to convey the culture of yesteryear for visitors to the District. The project assures handicapped accessibility throughout the public pathways, as well as street trees, gardens, and landscaping the public space consistent with plantings appropriate during the historic period of significance. Finally, ARRA funds will support the restoration of the Civil War Monument Park, the focal point of the District. The project was awarded $1.69 million of the $19.75 million ARRA funding allocated to the State of New Jersey. This represents the third largest award in the state.